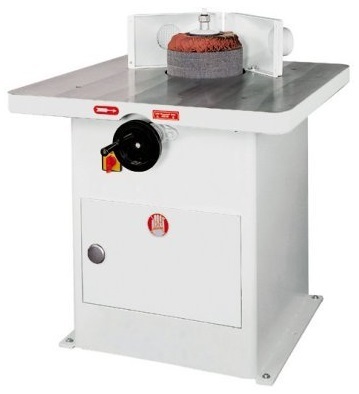 Vertical spindle, belt, brush sander. Ideal for sanding contour edges, such as chair seats, round plates, etc. Table may be tilted up to 45º for angular edge sanding. Sponge drum can also be replaced with an air or roller drum for spindle sanding operations. Table height can be adjusted for different sanding belt area.